Objetive.- To describe the surgical approach and laparoscopic management of acute appendicitis, report and compare our results with the literature. 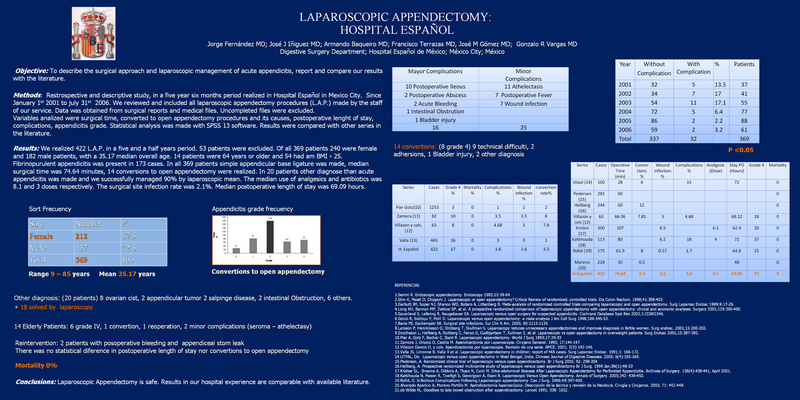 Methods.- We review and included all laparoscopic appendectomy procedures (L.A.P.) in a five year period realized in Hospital Espanol in Mexico City. Statistical analysis was made with SPSS software. Results were compared with other series in the literature. Results.- We realized 422 L.A.P., 240 in female and 182 in male patients, with a 35.17 median overall age. 14 patients were 64 years or older and 54 had am BMI › 25. Fibrinopurulent appendicitis was present in 173 cases, in all 422 patients simple appendicular base ligature was made, median surgical time was 74.64 minutes, 14 conversions to open appendectomy were realized. In 20 patients other diagnose than acute appendicitis was made and we successfully managed 90% by laparoscopic mean. The median use of analgesics and antibiotics was 8.1 and 3 doses respectively. The surgical site infection rate was 2.1%. Median postoperative length of stay was 69.09 hours. Conclusions.- Laparoscopic Appendectomy is safe. Results in our hospital experience is comparable with available literature.